As a new homeowner, you don’t always get everything on your wish list. Whether it’s a paint color you don’t like, dated countertops, or minimal storage space, there is usually one aspect (or a few) that you are looking to upgrade. And in terms of priorities, let’s be real—bathrooms tend to be at the bottom of everyone’s list because they are the room people spend the least amount of time in. Patti Wagner went the opposite route with her home. The designer took the plunge and decided to give her vintage bathroom a facelift; a rather in-depth one that included stripping 89 years worth of paint from the walls while maintaining the original character. Wagner and her husband also replaced the old flooring, which sat in wire mesh and a concrete mortar bed, with a hexagon tile more befitting of the time period to complement the original green tiling on the walls. From start to finish, this 47-square-foot bathroom took about two months to complete. If your bathroom is in need of a refresh, take a page from Wagner and turn your attention to your floors, as it’s one update that really makes a difference. Below, the designer shares what she learned about remodeling bathroom floors. We’re definitely taking note. This prevents unnecessary headaches and unforeseen expenses down the line. Wagner recommends figuring out how to remove the floor without damaging the wall tile, including the coved base, before you do anything else. “In the end, we decided to use an angle grinder with a diamond blade for cutting along the grout line (all the way down through the mortar bed that the tile sat in) around the border between the floor and the cove base tile,” she said. After that, they carefully removed the tile with a hammer and chisel/flathead screwdriver. While she recognizes that the type of work and time put forth may not be for everyone, Wagner believes anyone is capable of a bathroom floor DIY. “Anyone who is patient, not afraid to learn, and willing to take their time could do a project like this,” she notes. “Don’t be afraid of color and unique or original features. Whether it’s tile, paint color, hardware, or something as simple as a shower curtain,” says the designer. She admires when owners embrace original features that may not be super popular or on-trend, as she feels they tell a great story and make the room feel unique. Wherever possible, pay homage to the original design. 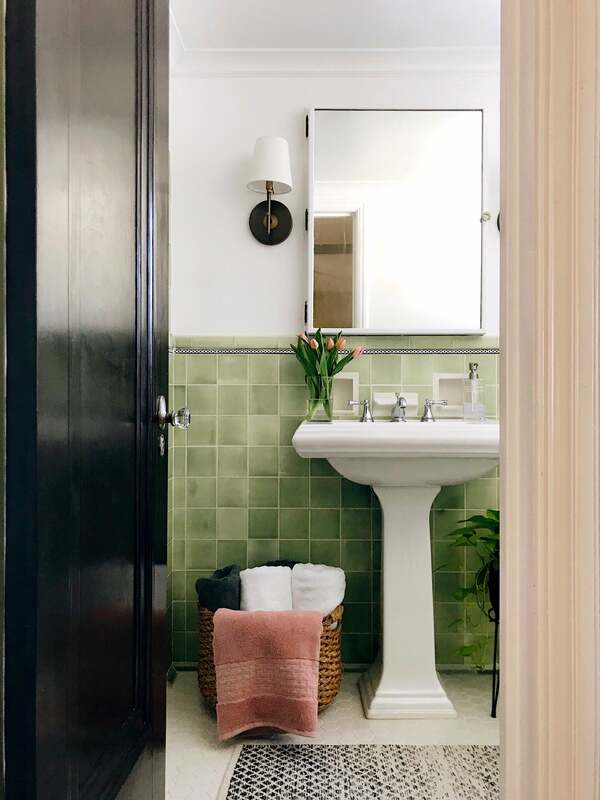 Here, the couple opted for a flat finish white hexagon tile to fit the time period and complement the original green tile as a way to freshen up the space.